Photo-4, a photo by Chindits on Flickr. On the second leg of his three-nation official visit, The Defence Minister AK Antony arrived in Perth from Singapore yesterday (Tuesday). Mr Antony was received at the airport by the Australian Defence Minister Mr Stephen Smith. This is the first ever official visit to Australia by an Indian Defence Minister. 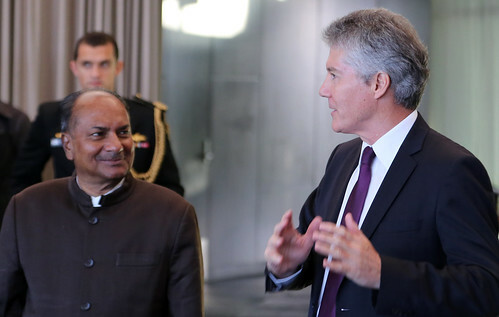 Speaking at a reception hosted in his honour at Perth, Mr Antony said the defence cooperation between India and Australia has increased substantially in the last few years. He said India values its strategic partnership with Australia and we are committed to further strengthen our bilateral relations in various areas including defence. Referring to the Indian Ocean Region, Mr Antony said it is critical to our maritime interests. He said India’s economic development is dependent on maritime trade. The security of shipping along with sea-lanes is of vital interest to us, he said. Speaking on the occasion, Mr Smith said the Indian Defence Minister’s historic visit is indicative of the increasing importance and depth of the Australia India bilateral relationship, including Defence-to-Defence and Military-to-Military cooperation. The reception was attended by prominent members of Western Australian and Indian academic, business and community organisations. Mr Smith said the 2013 Australian Defence White Paper ‘outlines the profound strategic changes that are occurring as economic, strategic and military weight shifts to our part of the world, the Indo-Pacific region’. He said ‘India and Australia have a shared interest in helping to address these strategic changes, including through Defence collaboration’. Mr Smith referred to Perth as Australia’s ‘Indian Ocean capital’. The city is home to several significant Australian Defence Force establishments, including Australia’s Indian Ocean Naval Base, HMAS Stirling. While in Perth, Mr Antony and Mr Smith laid wreaths at the State War Memorial at Kings Park. The State War Memorial, situated in the sprawling 1000 acre+ King’s Park, overlooks the City of Perth with beautiful views of the Swan and Canning Rivers and the Darling Ranges. The State War Memorial comprises the Cenotaph, the Court of Contemplation, The Flame of Remembrance within the Pool of Reflection. The Cenotaph was unveiled in the year of the Centenary of Western Australia - on 24 November 1929 by the Governor Sir William Campion, and had as the honorary architect General Sir J. Talbot Hobbs. The court of contemplation is at the western side of the precinct and was unveiled on 6 November 1955 by Sir Charles Gairdner. The Flame of Remembrance within the Pool of Reflection which burns continuously was inaugurated by Queen Elizabeth II on 1 April 2000. It symbolises the promise of all Western Australians that "We will remember them”. Underneath the Cenotaph is the roll of honour with the names of all servicemen and women who enlisted in Western Australia and died in the Boer War, World War I, World War II, Korean War or Vietnam. Distributed throughout the park are more specific memorials to various battles, military units, prisoners of war and other groups. There are also a number of memorial avenues where each of the roadside trees bears a plaque honouring an individual killed in World War-I or World War-II. Last evening, Mr Antony and Mr Smith travelled together to Canberra.